Jos Hooiveld is set to start for Celtic against Hearts on Wednesday and says he will keep his place and spur his side on to the title. Celtic defender Jos Hooiveld will return to the starting line-up at Tynecastle on Wednesday night and says he is determined to nail down a permanent first team place. The Dutchman said he has told Johan Mjallby he can help win the club the title if he plays regularly. Hooiveld, who was signed by Tony Mowbray from AIK Stockholm in January, started the season as Daniel Majstorovic’s partner in central defence, playing the Champions League qualifiers against Braga and the first two SPL games of the season. After playing in the 4-0 Europa League defeat against Utrecht though, he lost his starting place to compatriot Glenn Loovens. In an interview with Dutch broadcaster RTV Drenthe, he said that he felt he had been given some of the blame for that defeat but revealed he was carrying an injury as Celtic crashed out of Europe. Hooiveld found himself out in the cold as Celtic started the SPL in impressive style and when Lennon chose to replace Loovens, it was Norwegian teenager Thomas Rogne who was given his chance. Hooiveld admitted it was a blow to be over looked. Asked if he had reconsidered his future at Celtic and pondered a move away from the club, the defender told RTV he hadn’t given any thought to leaving the biggest club he has played for. Following Rogne’s red card against Aberdeen, Hooiveld has been told that he will replace the suspended Norwegian against Hearts. He revealed that he had told the coaching staff that he was ready to take his chance and that Celtic would see the benefits. 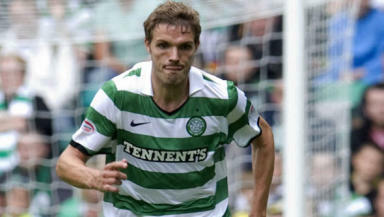 “Last Saturday I played in the second half (of the 9-0 win over Aberdeen),” he said. “Today, I have heard I will play in the defence on Wednesday. It’s very good news and I don’t intend to relinquish that position. “The assistant coach (Johan Mjallby) spoke to me after the last training session. He asked me if I was ready and if I felt good.